s soon as “The Rime of the Ancient Mariner” won general acclaim as a major poem in England, translations abroad started rolling off the presses. The first German rendition of the ballad was made by E. Freiligrath in 1831, followed in 1837 by a French one from the pen of J.A.X. Michiels. By the end of the century translations circulated in Italian (1889), in Latin (1889), in Russian (1893), and in Dutch. This essay seeks to provide some background information on the several Dutch versions of Coleridge’s poem published so far, as well as to briefly assess their merits. The first Dutch translation of the “The Rime of the Ancient Mariner”, entitled De Oude Zeeman (The Old Sailor), was volunteered by Gerrit Berent Kuitert in 1895 and published the following year by the minor publisher Erven B. van der Kamp from Groningen, bearing as an apt motto on the title page “He could behold Things manifold,/ Which have not yet been wholly told”, taken from Longfellow’s “Rain in Summer” (lines 70-73). Little is known about Kuitert. Born in Groningen in 1855 as the son of a schoolteacher, he became a professional language tutor of French, German, Spanish, and English, furnishing various translations, especially of English works, including Arden of Feversham (1592), A Yorkshire Tragedy (1606), and E.A. Poe’s “The Raven” (1845). He nursed poetical aspirations, and actually published a collection of poems under the title Oud en Nieuw (Old and New; 1903) as well as a play De droom van een kamerlid (The Dream of a Member of Parliament; 1893), in addition to contributing voluminously to local periodicals. He died in his home town in 1927. Interestingly, Kuitert prefaced his translation of “The Ancient Mariner” with a memoir of Coleridge’s life, offering in passing some critical lucubrations on the poem. Because these constitute some of the earliest Dutch responses to Coleridge and his “Ancient Mariner”, they are worthy of some attention. works charm by tenderness and loveliness, by a rich, luxurious imagination and mastery in the execution”. After a sketchy genesis of “The Rime of the Ancient Mariner”, which he deems to be Coleridge’s “most original and most striking… poetical composition”, he describes the poem as “having a haze of supernaturalness, while we are constantly surprised by touches of moving tenderness and a forceful painting. Written in irregular verse, in the tradition of old ballads, the poem captivates the reader by a lively, original presentation, and a rich measure of imaginative power”. Kuitert then addresses the controversial issue as to whether the mariner’s punishment and penance are proportionate to his crime, and whether, therefore, “the poet has not disturbed the symmetry by making the old sailor suffer so terribly for killing a bird”. There is no disproportion between the penance and the crime, Kuitert argues: not only was killing the bird a “motiveless deed” of “unaccountable cruelty” which was neither profitable nor favourable; it also displayed “the blackest ungratefulness” towards an animal sent as a harbinger of deliverance by a benevolent higher power. Finally, Kuitert dwells on his own translation. He asserts he has avoided mere “imitation” and has tried, “with the severest respect for the text” to “unite melodiousness with fidelity”, adding: “The prosodic idiosyncrasies of Coleridge’s poetic talent and the way he knows to enchant with rhyme, present diifficulties which require patience and devotion”. There is reason to suppose that Kuitert used for his translation A.L. Simpson’s edition of the poem, published in 1883, for in his Introduction Kuitert twice refers to this version and its illustrations by David Scott, which were originally published in 1837. The second translator who ventured a Dutch version of “The Rime of the Ancient Mariner”, was Anthonie Donker, pseudonym of Nicolaas Anthony Donkersloot, scholar, critic, novelist, and poet. Born in Rotterdam in 1902 from liberal-protestant parents, he revealed an early penchant for literature. He read Dutch at the universities of Leiden and Utrecht, where he graduated in 1929. In 1936 he was appointed Professor of Dutch literature at the University of Amsterdam. Because of his resistance to the German occupation, he lost his chair and was imprisoned. From 1956 he again taught Dutch literature at the same university until his death in 1965. Donker published his translation of Coleridge’s poem entitled “De Ballade van den Ouden Matroos”, subtitled “Coleridge: The Rime of the Ancient Mariner”, in the January 1928 issue of the De Stem (The Voice), a monthly literary journal founded in 1921 by the prominent Dutch critic Dirk Coster and the painter and art critic Just Havelaar, as an ethical-humanitarian and religious-socialist reaction against the general spiritual dislocation prevalent in the aftermath of the First World War. The paper invited contributions from more traditionally orientated Dutch and Flemish literati, including Nijhoff, De Merode, Buning, Van de Woestijjne, Vemeylen, etc., all ambitious young men of considerable qualifications who were to rise to prominence in modern Dutch literature. After Havelaar’s death in 1930 Donker himself became Coster’s editorial assistant. De Stem expired in 1942. Donker’s translation of Coleridge’s ballad, which he dedicated to his friend, the leading expressionst poet Hendrik Marsman (1899-1940), went unprefaced and did not include Coleridge’s associated prose glosses first included in Sibylline Leaves (1817). There is no need here to look at Donker’s performance in detail. Suffice it to say that Donker offers an extremely free translation both in wording and versification. At times his version deviates so far from the original that it seems as if the translator has contented himself with mere paraphrases, thereby disregarding Coleridge’s terseness of expression and haunting imagery. know how many copies of Coleridge’s poem Stols printed in Kaleidoscoop. After De Stem’s demise in 1942 Donker chose to continue this journal’s cultural and political policy, albeit in a more radical vein, in The Nieuwe Stem (The New Voice), which he established in 1946, attracting a plethora of leading, chiefly leftist, contributors such as J. M . Romein, J. H. Pos, O. Noorderbos and others. In the December 1949 issue Donker inserted a radically reworked version of his earlier rendition of “The Rime of the Ancient Mariner”, which, as he acknowledged in a Postscript to his second translation, he had composed in 1944, declaring that in this new translation he had tried “to follow as faithfully as possible the measure, rhythm, rhyme and text of the original poem”. Let us briefly examine Donker’s second venture at offering a Dutch “Ancient Mariner” to the readers of his De Nieuwe Stem. Houdt een van het drietal aan. Waarvoor? laat mij toch gaan! Ik ben er kind aan huis. 'Er was een schip,' sprak hij. Daar liet de hand hem vrij. Maar 't glinsterend oog hield hem nog vast. De zeeman heeft zijn zin. inserting internal rhymes in his verses. This new translation by Donker was again published in book form by the famous publishing company J.M. Meulenhoff from Amsterdam as number 33 of The Ceder ( The Cedar), a series, founded in 1945, which brought out shorter literary works and translations as well as original Dutch compositions. Meulenhoff reproduced a verbatim rendition of Donker’s “The Ancient Mariner” as printed in De Nieuwe Stem, but for the first time Donker also furnished a translation of Coleridge’s marginal prose glosses. A few years after Donker’s death, his new translation of “The Ancient Mariner” was once more selected for a separate issue published by De Roos from Utrecht in 1967. This bibliophile Foundation was launched in June 1945 by Christiaan Leeflang, Charles Nypels and G.M. van Wees “with the purpose of bringing out printed matter solely for the disinterested or non-commercial devotion to fine typography and art in all conceivable forms in which they can be combined.” The Foundation was exclusive in that it was restricted to 150 members and for years there was a long waiting list to become a member. Every year about 3 or 4 numbered editions were printed in a run of 175. For the design, illustrations, printing and binding a diverse range of people and companies were employed so that the editions as a whole reflect the contemporary Dutch possibilities in this field. Clearly, De Roos’s purpose was always to issue shorter literary foreign, native and translated works designed for an elect Dutch readership. Even a short list of the foreign titles among which Donker’s translation appeared will give a fair idea of the range and variety of De Roos’s editions: Oscar Wilde’s Salome (1949), Alfred Jarry’s Ubu roi (1949), Thomas de Quincey’s The English Mailcoach (1950), Honoré de Balzac’s L’ elixir de longue vie ( 1951), Elizabeth Barrett Browning’s Sonnets from the Portuguese (1957), and Thomas Dekker’s The Guls Hornbooke (1960). Many of these, including Donker’s translation, have become much sought after titles by Dutch and Flemish bibliophiles. De Roos’s edition of De ballade van de oude matroos, was finely printed in a Van Dijck letter type (font) on Habnemüble-Bütten paper by Hooiberg, a house specialising in typographic production. The volume was bound by the reputable house Proost and Brand in Amsterdam. For the first time a Dutch “Ancient Mariner” featured original drawings made by Mart Kempers (1924-19933), a well-known and prolific typographer, painter, and engraver who was also much in demand as a book-illlustrator. Kemper’s style is described as figurative-impressionistic. 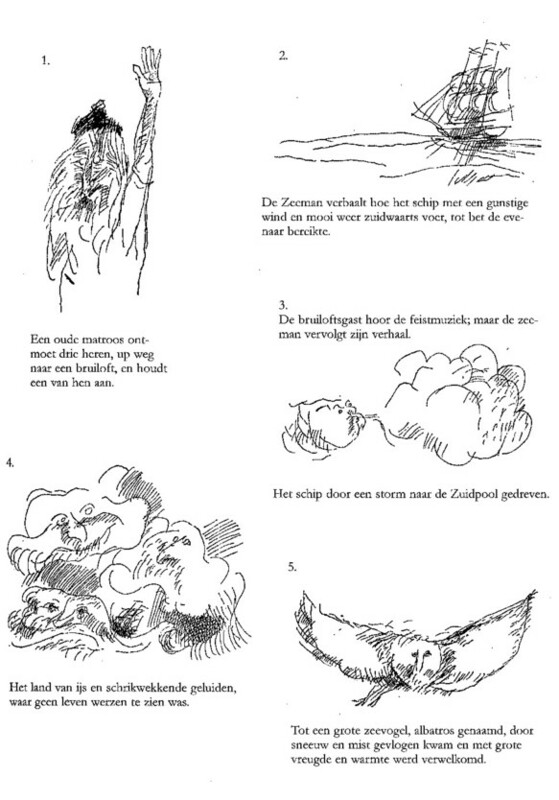 His 34 illustrations for De ballade van de oude matroos are singular pen-and-ink drawings, which reduce the poet’s narrative to a deliberately simplified, almost childlike pictorial idiom, which clearly seeks to de-dramatise the mariner’s ordeal (see fig1 and fig2). of Hans Christian Andersen (1989) and the Grimm brothers (1989) and A History of the Crusades (1987). His version of Coleridge’s ballad called Het lied van de oude matroos (The Song of the Old Sailor) was published jointly by Ridderhof from Rotterdam and Deka Boeken from Antwerp, who specialised in children’s books such as translations of Uncle’s Tom Cabin, A Children’s Bible, Favourite Classics, Fairy Tales, etc. Both houses have ceased to exist. The outward appearance of Van Steenbergen’s translation is by far the more attractive than all the previous translations of “The Ancient Mariner”, for the 87page work boasted 42 of the famous engravings made by Gustave Doré for A Barnier’s French translation of the poem published in 1877. The full cover of Van Steenbergen’s book featured a turquoise coloured copy of Doré’s engraving of the mariner’s confession to the hermit. Obviously the publishers aimed at a wider or more popular Dutch and Flemish readership. This edition opens with a Preface, written by an unidentified editor, which briefly relates Coleridge’s life up to the publication of “The Rime of the Ancient Mariner” in Lyrical Ballads as well as a circumstantial account of Doré’s career. Of Van Steenbergen’s translation the editor says that it has succeeded in fully expressing “the subtle melodies, the psychological depths and the unbearable fears so characteristic of Coleridge’s composition—a unique achievement only possible because Van Steenbergen was so gripped by Coleridge’s art”. As to Van Steenbergen’s performance, it is of all the Dutch translations so far discussed the most modern in terms of diction and imagery. It reads fluently and avoids archaisms or strained expressions. 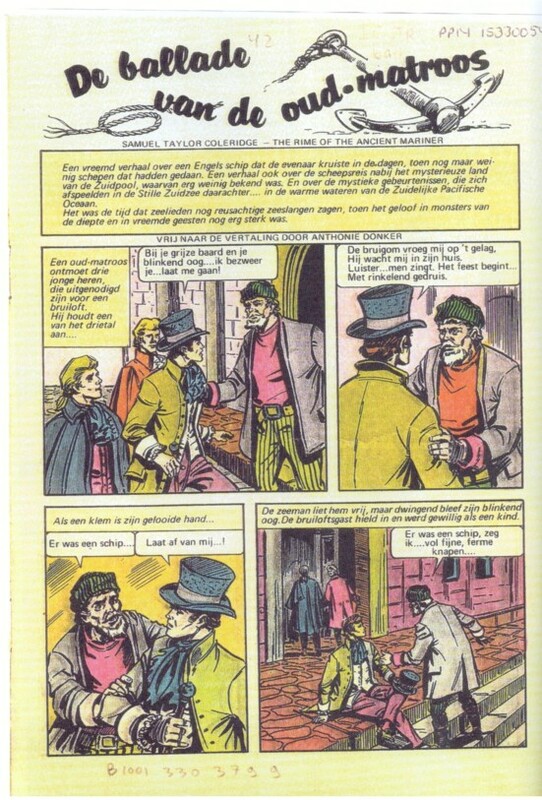 Van Steenbergen’s translation, including Dore’s illustrations, was again published in 1987 without any changes either in outlook or text, by Rebo Productions from Sassenheim, a now international publishing firm specializing in all sorts of subjects, except belletristic work. strings try to prevent him from doing so. At the top of the second page we find the Dutch title of the strip—“De ballade van de oud-matroos”—attributed to Samuel Taylor Coleridge, followed by the following introduction: “A strange story about an English ship that crossed the Equator in those days when few ships had done this. A story also about a ship’s voyage to the mysterious land of the South Pole, about which little was known. And about the mystical incidents that took place in the South Sea in the warm waters of the southern Pacific Ocean. It was the time that sailors saw gigantic watersnakes, when the belief in monsters of the deep and in strange ghosts was still strong”. It remains to consider two notable translations of “The Ancient Mariner”, not into Dutch, but into its related language Frisian. The first, entitled “De ballade fen d’ald-matroas”, was made by André Roelof Scholten (1910-1944), a theologian who zealously advocated the Frisian language and its literature. His rendition of Coleridge’s poem was published in four instalments in the April 1935 issues of Sljucht en Rjucht (Simple and Straightforward), a popular weekly magazine established in 1890 to promote the cause of Frisian culture. The whole poem was reissued as a separate booklet in 1935 by Willem Arnoldus Eisma, a printer from Leeuwarden who brought out Sjucht en Rjucht and several works in Frisian. Scholten’s translation contained on the backside of the title-page a screenprint of a sailing-vessel with a huge bird seen flying away from it, made by the artist Johannes Mulders (1899-1989), who earned his living chiefly by engraving illustrations for books. The second Frisian translation of Coleridge’s poem with the title “It lied fan de ald matroas” was provided by Klaes Dykstra (1924-1997), a graduate of the University of Amsterdam and member of the Frisian Academy, who supported Frisian culture and was a poet in his own right. His attempt was published in 1962 in “Reiddomprige”, a sequel brought out by Laverman from Drachten since 1949, offering only original modern Frisian collections of poetry. In fact, Coleridge’s poem was the only translation of a foreign work ever to appear in the series. 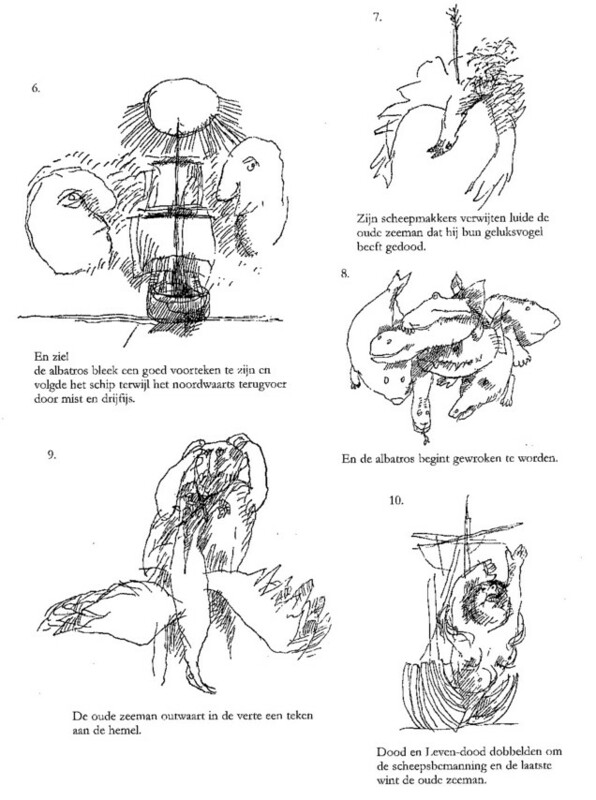 The publication of Dykstra’s rendition also included the poem “It Slaveskip”, a Frisian translation of the Brazilian poet Antonio de Castro Alves’s Navio Negreirro by G.N. Visser, also an advocate of the Frisian cause. As I am unfamiliar with the Frisian language, I cannot assess these Frisian translations. Mariner” was turned into a strip-cartoon published in the extremely popular Illustrated Classics must have contributed to its familiarity with many youngsters. Then too, the fact that “The Ancient Mariner” was twice translated into Frisian, a language only spoken by about half a million people, Frisians and non-Frisians in the Netherlands, testifies to the unflagging attraction the poem has exercised in the Low Countries. This and the subsequent translations from the Dutch are my own. 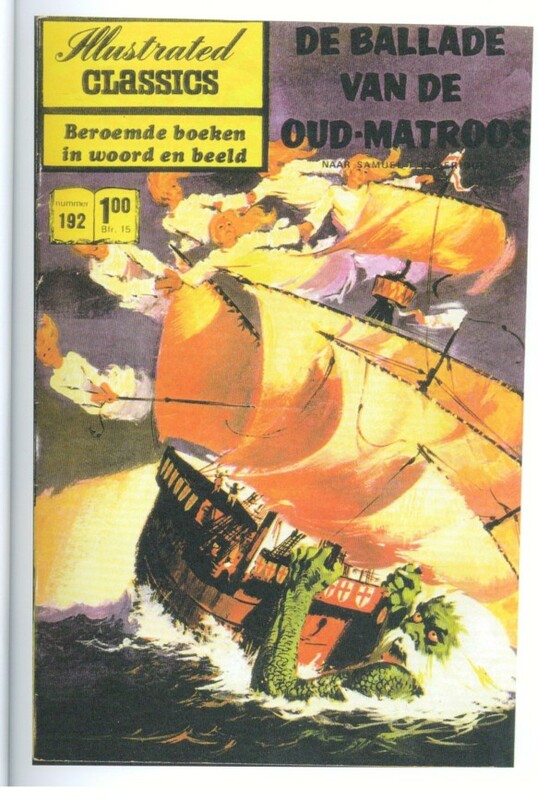 “Tweemaal Coleridge’s Ancient Mariner in het Nederlands”, De Nieuwe Taalgids 1958, 36-39. On Donkersloot, see Winkler Leicon van de Nederlandse Letterkunde (Amsterdam- Brussel, 1986), p. 119. Letter from A Stols to Donkersloot, dated 14 November 1930, preserved at the Letterkundig Museum at The Hague.